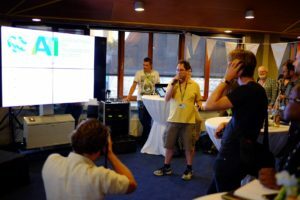 Twenty teams worked on their ideas to show off creativity, the use of multiple data sets, humour, and potential impact. Teams and skills varied widely (from “me and my laptop” to five or six people, and from “I wanted to try this thing” to “we mashed up A, B and C and ran it through X, Y and Z”), and so the pitches at the end of the day were an entertaining variety of ideas and execution. The winner was “Who is the smartest citizen?”, a clever app that uses templates and a dataset to create a quiz with unique questions to test your knowledge, and let’s you challenge your friends to answer those same questions to see who is really up to date on the world. Maaike Blom and I were invited to host a side event for policy makers on money flows and results in development cooperation. No surprises: we prepared a 45-minute session on IATI. 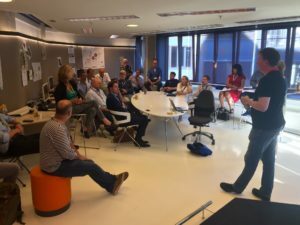 Maaike had to cancel, unfortunately, but Martine Koopman took over brilliantly and helped steer the conversation with over 20 people in the room. My story was about the demand from Parliament to add expected and achieved results to the government budget of 2017, and how IATI is a tool that can help shed light on these results. In fact, in January 2012, then-Secretary of State Ben Knapen answered questions from then-parliamentarian Ajran El Fassed (now the director of the Open State Foundation and co-organiser of the Accountability Hack) on the progress of implementing IATI. 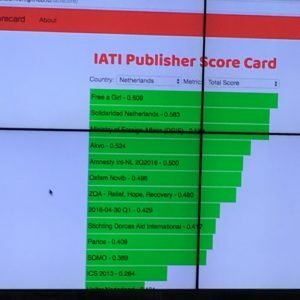 Knapen said that IATI would be a tool to reduce the reporting burden for recipients of government funding (and thereby, of government itself). 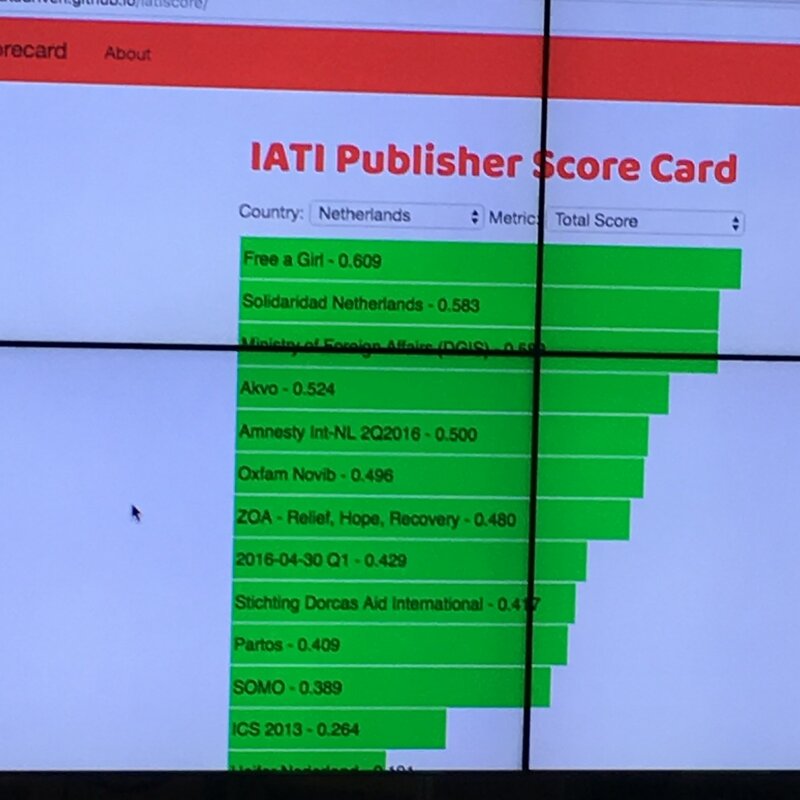 Four years later, IATI is the required format to report progress on activities, and we’re in the middle of the challenging puzzle of how to combine all the results into a coherent picture. gantt charts that can provide insight in the progress and results in those activities. 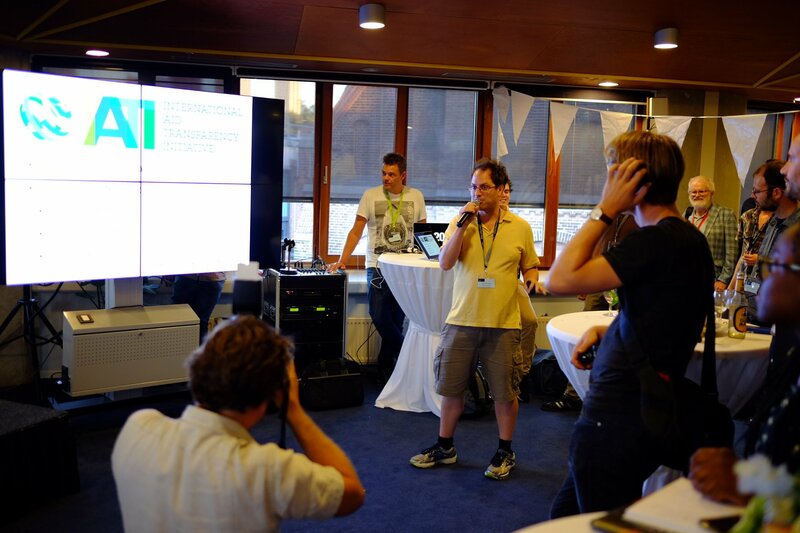 Meanwhile, Alex Bertram, Maarten-Jan Kallen and Hannes Mühleisen of team BCDWDI (BeDataDriven and CWI) started the day trying to crunch the puzzle of messy organisation names, exploring some new matching algorithms to look for similar names in the IATI universe. They quickly came to the conclusion that this was not something they would solve in a day, and they shifted their focus to data quality, and presented a country-by-country ranking of the data quality of each publisher, with a few more metrics to rank them by. The code is available too. The organisation identifier issue came up more. Open State combined different sets of identifiers for government bodies in an attempt to allow cross-walking data sets. With plenty of (government) data publishers and a big crowd spending a sunny Friday night listening to open data pitches, definitely a fruitful event! The report back of Sanne Oehlers of Data4Development is online too. Posted in Aid Transparency, Conferences, Open data and tagged IATI.